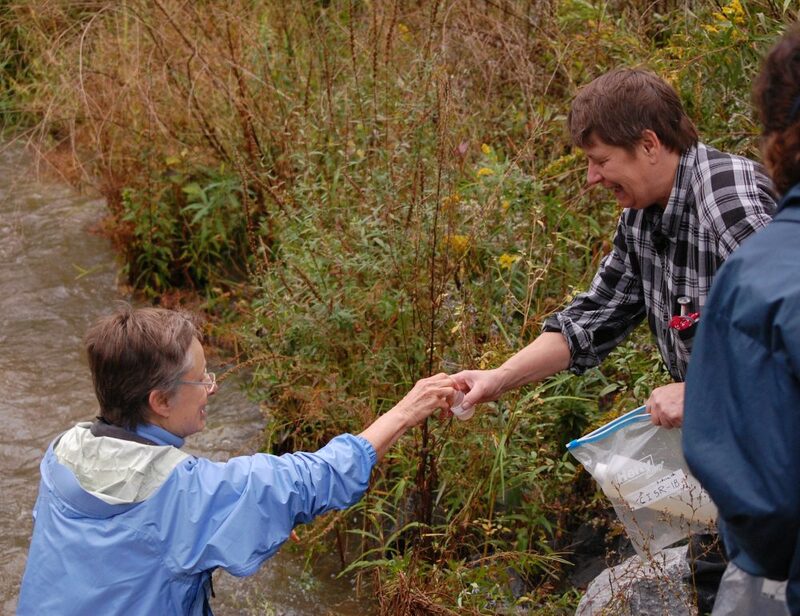 The Synoptic Sampling partnership is CSI’s longest-running volunteer water monitoring program, beginning in 2002 in the Fall and Virgil Creek watersheds. The goal is twofold: produce ongoing data that informs water resource management decisions by local government while simultaneously educating and empowering citizens to become stewards of their local environment. CSI’s synoptic sampling volunteers are active in the Cayuga Lake and Seneca Lake watersheds. What do Synoptic Sampling volunteers do and how often do they do it? Groups of volunteers are organized into teams that collect stream samples several times per year at fixed locations in a single watershed. These samples are collected “synoptically” or all on the same day within a few hours to ensure that stream flow and meteorological conditions are consistent at all locations. Volunteers collect samples, measure water temperature on site, fill out chain of custody sheets, and transport samples on ice to the CSI lab for certified chemical and bacteriological analyses. Depending on funding, synoptic sampling volunteer groups sample 2-5 times per year. At a minimum, CSI aims to arrange one base flow event and one storm water event for each watershed. The time commitment involved is 2-3 hours per monitoring event. Check out this video shot and produced by Ithaca College students to learn the ins and outs of CSI’s synoptic sampling and why it’s so special and important. What are Synoptic Sampling volunteers monitoring for? The synoptic sampling partnership is a traditional water monitoring program that includes a number of indicators of agricultural and residential development impacts, including: pH, alkalinity, turbidity, inorganic and organic nitrogen, phosphorus (both dissolved and total), E. coli (indicator for pathogenic bacteria), chlorides, total suspended solids, specific conductance, and total hardness. 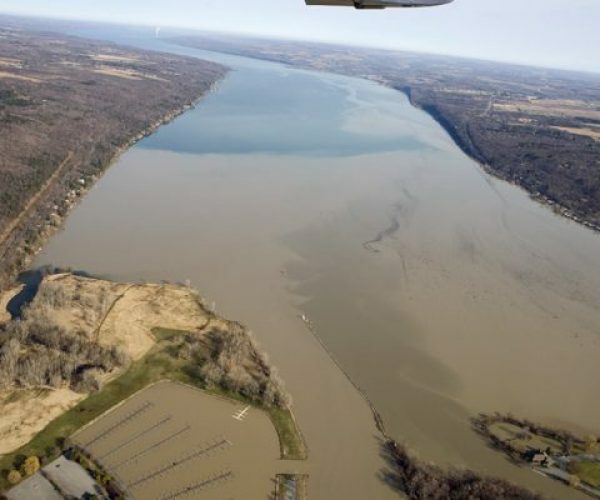 The photo to the left shows sediment plumes going into Cayuga Lake after a heavy rain. Monitoring after rain storms helps us learn about how much sediment is traveling into Cayuga Lake and where it is coming from. Many of the aforementioned parameters double as indicators of contamination from shale gas wells. In an effort to establish more comprehensive baseline data for watersheds that may be affected by hydrofracking, CSI’s synoptic partnership added the following hydrofracking indicators at selected locations from 2012 – 2014: total dissolved solids, chemical oxygen demand, MBAS (surfactants), barium, strontium and gross alpha and beta radioactivity. CSI stopped monitoring the “hydrofracking indicators” following the implementation of New York State’s hydrofracking moratorium in 2015. The baseline dataset is still publicly available in CSI’s database. Where are volunteers currently monitoring? 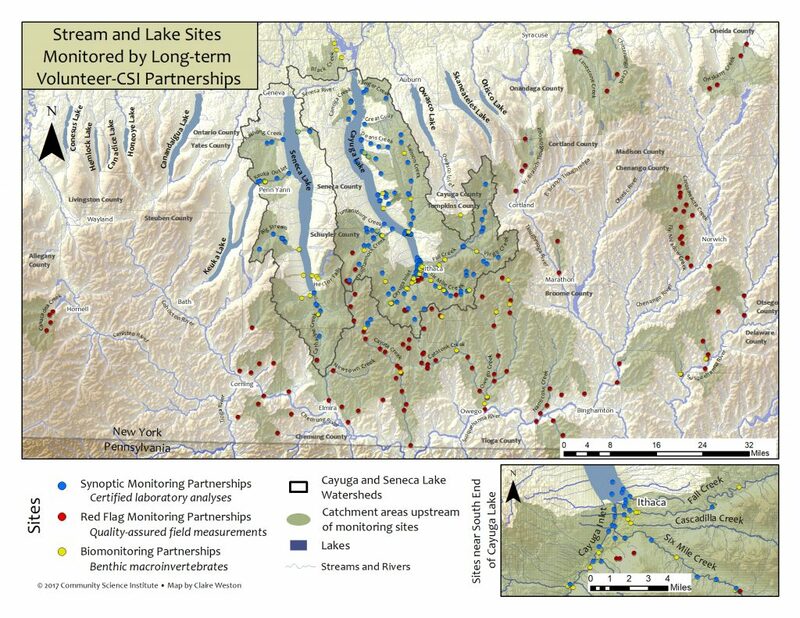 Currently, the vast majority of CSI’s synoptic sampling partnerships are in the Cayuga Lake and Seneca Lake watersheds. Volunteers monitor Fall Creek, Virgil Creek, Six Mile Creek, Salmon Creek, Trumansburg Creek, Taughannock Creek, the Cayuga Inlet (including Enfield, Buttermilk and Cascadilla Creeks), as well as several small streams that flow directly to Cayuga Lake including Yawger Creek and Great Gully. In the Seneca Lake watershed, volunteers monitor Catherine Creek, Big Stream, Kashong Creek, Keuka Outlet, and Reeder Creek. All locations can be viewed in the CSI Database, along with data going back to 2002 – over 87,000 certified data items to date. Click on the site map to enlarge.